Royal Arcade, Newcastle upon Tyne, built 1831-32. The arcade contained shops, offices, banks, auction rooms, post office and a steam and vapour bath. It was demolished in 1963 and a reproduction included in the Swan House office complex. Drawn by T. Allom and J. Ting. 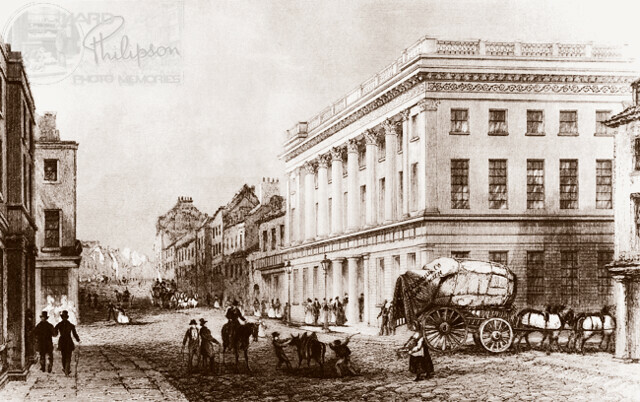 The Royal Arcade was built by John Dobson in 1832 and demolished in 1963 when part of it was reproduced in Swann House, at the bottom of Pilgrim Street, Newcastle upon Tyne.